Greetings from Brodsky & Treadway! 8mm filmmakers, technicians, writers and advocates, Bob & Toni have been working together since 1975. We have no plans to retire, but we are a small, two person studio and so are ever more careful about the work we schedule. We note that as we age, the films we are working on have gotten older, too. We see more films now that need special handling due to shrinkage, color fading, and other manifestations of poor storage, processing or use. These take time. Please call us about your old films before you ship them. We do high quality, scene by scene wet-gate transfer of small gauge movie film generally destined for professional productions. We work solely on camera original reversal film in 16mm, Regular 8mm, or Super 8mm gauges. We make video masters on Digital Betacam, only scene by scene, with wet gate. Our studio is NTSC Standard Definition to give you each scene fully color and density corrected, at the appropriate frame rate, shown full frame in its original 4:3 aspect ratio whether as SD or pillar-boxed in HD. We believe that director and editor are the correct persons in the production thread to make choices about presenting original movies in other than original aspect ratios. Scenes from our NTSC masters have been edited into HD television productions around the world. We offer special handling of selected, shrunken, damaged or deteriorated original film. We can work with sound on film and unusual sound sources. We do not work on negative film or prints. Our work is by appointment only, and turn-around can be one day if arranged. Please call Toni to estimate and schedule your work. Please scroll down the rest of this page to read the details before calling. We are small, only two people. While we do try to hold time for television producers under deadline, larger jobs often wait in our queue. Be aware that Toni will often advise you to do triage on your material to have us work on only select rolls or scenes. Thank you. Who does NOT need our work? Our speciality is very high quality transfers of CAMERA ORIGINAL REVERSAL FILM and only that. We handle Regular or Standard 8mm, Super 8mm and 16mm gauges, including film which is quite shrunken or deteriorated. We do not work on negative filmstock at all and prefer not to work on print material unless you particularly need us to handle a sole surviving copy. We love black & white and color reversal film Brodsky's speciality is to work to reveal the details in majestic B&W or venerable Kodachrome reversal film and the glory of film in spite of the limitations of digital playback. We work on motion picture film that is new or old, archival, shrunken, deteriorated or damaged for artists, archivists, and television producers. We have been able to capture images from film with very severe deterioration and shrinkage from 1% to as much as 4%. Our work is FULLY COMPONENT ANALOG or DIGITAL with SCENE-BY-SCENE COLOR IMPROVEMENTS and CONTRAST CONTROL. We work in Standard Definition as the original movie film we work with was shot in 4:3 (or 1:1.33 aspect ratio) not widescreen. We want producers and their editors to decide in post-production if and how and where to crop the image for widescreen presentation. We advocate you consider full frame presentation of historic moving images with pillar boxing when a 4:3 film must be presented in widescreen. WE ALWAYS WET-GATE for SCRATCH SUPPRESSION unless by agreement with an artist about a hand painted or altered original. WHO NEEDS OUR TRANSFER SERVICES? or if you had work done elsewhere and think your films can look better. WE make masters on standard definition NTSC, North American broadcast television standard in these formats: BETACAM-SP or DIGITAL BETACAM. This assures that you have a robust medium on the shelf alongside your real treasure, the very durable original film. Your motion picture film, if it is in good condition now and if stored properly (cool and dry) is expected to last centuries longer than current electronic or digital media. We are betting our video masters on Fuji stock will be stable and retrievable for 20 to 30 years at which time your company or family should plan to migrate the contents of the tapes forward to some media not yet invented, but hopefully better than digital files on drives. We can make you Prores 4:2:2 digital files for desktop editing, or copies on DVD for sharing with family for home viewing. Our sister site www.LittleFilm.org has pages of recommendations on how to annotate movies, gather additional information, store original film and access, edit or share the contents of these remarkable little films. LIKE EACH ROLL OF 8MM FILM. Please contact us via email and send us your name, location, phone number, questions and the best time to reach you by telephone. Please understand, due to their complex nature, we cannot repond to technical questions or requests for estimates in writing as that is time consuming. In all cases we prefer voice contact. Toni, tel: 978-948-7985 or Treadway [at] LittleFilm [dot] org. ON ARCHIVAL FILM WE STRIVE TO REPRESENT ORIGINAL CAMERA FRAME RATES so that the motion is natural. On artists' films, WE CAN RENDER IN DESIGNATED FRAME RATES, VARIABLE FROM 1 TO 24 FRAMES PER SECOND as instructed by the artist or the director. WE DO CAREFUL FILM HANDLING, INSPECTION, REPAIR, RECONDITIONING, and RESPLICING AS NEEDED. WE CAN TRANSFER SHRUNKEN OR DETERIORATED ORIGINAL 8mm, SUPER 8 OR 16mm reversal MATERIALS. THIS IS A SPECIALITY. WE TRANSFER SYNC SOUND from "all the usual suspects"
LIKE OPEN REEL AUDIO TAPE, or AUDIO CASSETTE. We can do sync corrections in the above formats, or you can in post-production. There is NO CHARGE FOR CLEANING unless unusual circumstances present themselves, such as advanced mildew, sticky tape or chewing gum. It is our prerogative to make our work as clean as possible. We check and clean film by hand. We will advise you when we need to charge for special handling, repair or assembly. We work by appointment only. Most often we transfer and ship work on the day as scheduled in advance with you. Please plan your production carefully. We encourage you to book time with us 10 days in advance, much longer if the job is large or if you are combining a transfer session with other travel to New England. We ask for a check as deposit on work booked in advance based on our estimate. We are very old-fashioned; we do not accept credit cards unless you prefer to pay through Paypal. If you have sent a deposit and overpaid, we will refund any balance immediately. We reserve the right to add a surcharge for work performed with less than 48 hours notice, for nights, weekends or for jobs requiring unusual or extra documentation. If you are well organized and reasonable to work with, you may well avoid surcharges. We transfer original materials which are usually carried to us in the hands of the original owner. If you are asking for service on a film not made or owned by you, we need you to get permission and clear all rights and releases prior to working with us. We infer that your contracting for our work means that you have the right to copy the material. Your films have artistic, historic and sentimental value to you or even perhaps monetary value to your production. We treat your films with great care while they are in our hands, but we do not assume responsibility for loss or damage to your films whether they are in our possession or in transit. Common carriers have advised us they do not insure films for content but will only insure for replacement value of raw film stock. In some instances the films need to be hand carried in which case a supervised transfer session is recommended. Supervising the transfer can save you money if you have done the work to be very familiar with the footage, have organized it and assembled it. In some cases, a documentary producer will want selected shots from a very large collection. Please contact us for best ways to mark selects. Brodsky & Treadway have handled unique original film materials for diverse filmmakers and institutions. Jem Cohen, Joe Gibbons, Saul Levine, Poli Marichal, Anne Charlotte Robertson, Michael Stipe, Sanjiban, Rea Tajiri, to name a few......as many as 300 visual and performing artists came to work with us a year for over two decades. Orlando Bagwell ("Malcolm X: Make It Plain"), Ken Burns, Natatcha Estebanez, Ricky Leacock, John Marshall, Robert Gardner, Glenn Holsten, Lawrence Hott ("Imagining Robert"), Spike Lee ("Four Little Girls"), Ricardo Mendez-Matta, Michael Moore ("Bowling for Columbine" first documentary invited to Cannes), Bill Moyers, David Sutherland, Jane Weiner, and other filmmakers. For 25 years we have handled the historic personal film records that are unique footage in great Public Television series like Ken Burns' series on The National Parks, The War, and Vietnam; PBS's series Frontline, The American Experience, Eyes on the Prize, Nova, Zoom, and P.O.V. We also restored moving images used in ABC's The Twentieth Century and for documentary production at the BBC. When you see old home movies in a documentary film looking wonderful, clean, scratch-free, with good shadow detail, and the movement on screen was rendered at the proper frame rate, it is quite likely we transferred it. Alternately, when in a music video or reenactment film uses Super 8 film for a flashy, degraded or a trendy look in a cutaway, it is likely we did NOT handle it. The Academy Film Archive, The United States Holocaust Memorial Museum Steven Spielberg Film and Video Archive, The Human Studies Film Archive at the Smithsonian Institution, Northeast Historic Film, The Guggenheim Museum, The Whitney Museum, George Eastman House, The Japanese American National Museum, The National Center for Jewish Film at Brandeis, The American Folk Art Museum, The J.F.K. Library, The Dance Collection of the New York Public Library, Yivo Institute, local historical commissions, state and university archives, and private family collections. Transfers: one hour minimum. We have day rates for training staff people at archives on site. Call. , hourly for evaluation, condition reports, recommendations, reel assembly, repairs, re-splicing, removing mildew and reconditioning as required. Call. WET GATE TRANSFER SCENE-BY-SCENE ONLY, REVERSAL FILM ONLY. This means that base scratches will be greatly diminished or disappear and your film will look as clean as a possible. Bob Brodsky is only happy doing scene by scene transfers of reversal film because that is his speciality. We do not offer one light, best light, straight through transfers. Call Toni for a quotation. When you call, she will want to know the gauge, number of reels, amount of film and condition of your film. We have a 1 hour minimum, and then quarter hour increments for transfer. Special handling needed for VS films cannot be discussed but not firmly estimated. We provide new Fuji (and only Fuji) videotape at cost. We master to NTSC SD Digital Betacam and can give you SD or HD digital files. If time allows, we can make Prores 4:2:2 digital files or a viewing copy on DVD for the family. We track all packages in and out, so you must call before shipping with carrier and tracking number. We handle original materials which are irreplaceable. Master videotape and original film are shipped separately for safety. This insures that an original film and master are never in the same airplane, truck or location in transit. Please telephone us to work out strategy for delivery so we know shipper, tracking numbers and date of arrival. We highly recommend services with tracking barcodes that require signatures, such as FedEx Express (not Ground), USPS Priority Mail with Delivery Confirmation, or UPS next day air service. Please pack film in a cardboard box with adequate padding. Never ship any media, film, audio or videotape in a fiber-filled bag; NEVER! Our 1983 filmmaking book "Super 8 in the Video Age" is long out of print. If you find a used copy online, it is useful in spirit, but be sure to check facts and labs before following outdated production protocals. 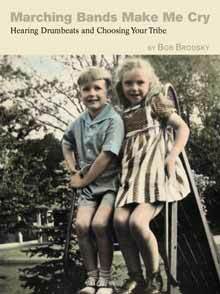 Bob BRODSKY's 2005 memoir "Marching Bands Make Me Cry" is available. It's not about filmmaking but his long awaited memoir of growing up Victorian in the McCarthy era and the people who shaped him. Click on the cover image to link you to his book page. NEED MORE INFO? Please visit our sister site www.LittleFilm.org as there we have information about small gauge filmmaking today, lists of labs as well as tips on restoration and preservation of old home movies, independent film and artist's films. for the culture, for your great-great-grandbabies, for posterity.